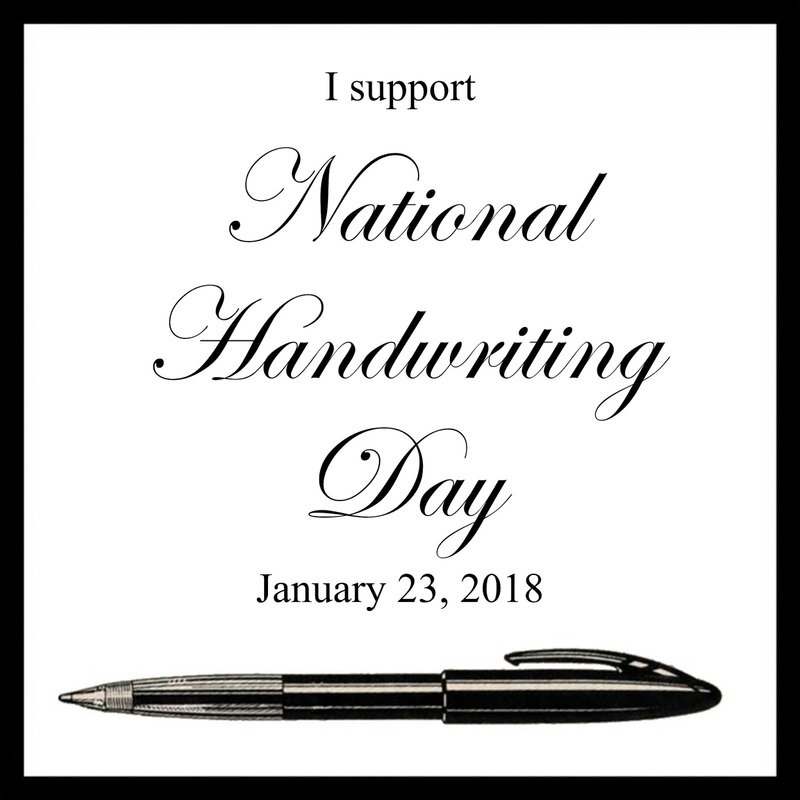 It's National Handwriting Day and once again it's time for my annual post (rant?) on the importance of cursive handwriting instruction in our society, specifically the United States. Writing in cursive has very real, proven benefits. Children who are taught cursive handwriting show improved motor skill development, while student notes written in hand help generate ideas and allow greater retention of information received. 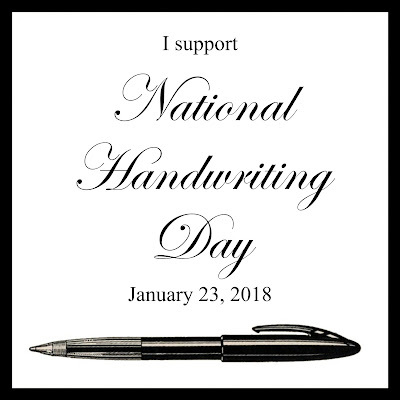 For more specifics and sited sources, I encourage you to read my original 2015 National Handwriting Day Post and if you're passionate about penmanship this Ted Talk video, by the artist and calligrapher Jake Weidmann, is a must (his work is amazing!). Under the educational Common Core Standards adopted by most states, handwriting instruction isn't mentioned at all – only 'legible manuscript writing' in kindergarten and grade one, followed up by the requirement that students demonstrate keyboard proficiency by the end of the fourth grade. Given that major companies stand to profit from Common Core implementation and testing, perhaps that's why keyboarding is mentioned specifically, and handwriting not at all. Google which companies are profiting from Common Core Standards and you'll quickly see what I mean. Not all states, however, agree with this egregious omission. Many states in the US have taken the initiative to pass supplemental legislation or standards requiring handwriting instruction as part of the public school curriculum. According to the Southern Regional Educational Board fourteen of its sixteen members require handwriting instruction – Alabama, Arkansas, Florida, Georgia, Louisiana, Maryland, Mississippi, North Carolina, Oklahoma, South Carolina, Tennessee, Texas, Virginia, and West Virginia. Some of these states have passed legislative statutes to help insure that handwriting is taught, while others have adopted standards, although standards tend to be assessed at the local level, making it difficult to judge progress. Still, they're steps in the right direction. This movement isn't limited to just southern states. Arizona adopted foundational writing standards in 2016 that make cursive part of the curriculum in all public schools, while the State of Illinois passed HB2977 in November of last year, requiring that every public elementary school and high school include cursive handwriting instruction in its curriculum. The largest school district in the country – New York City Department of Education – initiated a new cursive writing directive in 2017. It's interesting to learn that this later came about as a result of New York state assemblywoman Nicole Malliotakis's experience watching an eighteen year old sign a voter registration form in block letters. When told he had to actually sign the form with his signature, he replied he couldn't, he'd never learned to write script. I find that downright sad. I too support cursive in school. It is sad that an adult can't sign their name. I remember it being so exciting to begin learning script writing (I believe it was in third grade). C'est une bonne initiative plus le temps passe et les enfants savent de moins en moins lire et écrire en lettres coursives. .. j'essaie d'écrire mes cartes à la main meme si je ne suis pas très fière de ma calligraphie ... il me faut absolument un cours, il ne jamais trop tard ! !